Thanks to BettyBl. Usual rules apply. No, not the bad film with Robert De Niro in it (though it does have one good car chase); more the term itself. Stolen from Wikipedia, it refers to “A masterless samurai during the feudal period (1185–1868) of Japan. A samurai became masterless from the ruin or fall of his master, or after the loss of his master’s favor or privilege.” These chaps roamed the land, offering up protection to people who could afford it. Russell has already blogged about this pretty extensively (yes, he even won the ‘Battle of Big Thinking’ with some thinking on the topic), and is living it with the OIA. And I’ve been thinking about it myself a bit recently. Given that I’ve been through the demise of an agency, with people scattered to the four winds, I’ve only now been able to get a rough idea of just what everyone’s up to (yes, Facebook helps). What struck me is how many people are freelancing at the moment; whether they are experienced or not, whether they are planners or not…and how many seem to have either founded little businesses or already owned them. Russell’s words kept ringing in my ears – but it took living through what I’ve done in the last few months to truly appreciate it. People living lives on their own terms – it’s very easy to SAY you are going to do it, or pick a brand which seems to suggest you are doing it (but often is complete lies – like choosing a branded coffee or water to claim exclusivity; and yes, I buy ’em too), but DOING it is quite another thing. Even just into my planning career, I seem to be doing bits and bobs as well. Which is great – it’s always nice to be wanted. But why should this be? Well, people always value outside help. Rob @ Cynic’s post about making pitches and client presentations above and beyond expectation seems to chime here. Bring in an informed outsider/expert, and you can simultaneously get a series of valuable insights whilst keeping overheads and margins down. And with all the current confusion over just how planning is evolving (notably by Mark Earls, Mark Hancock, Gareth Kay and Zeus Jones), and whether it should still be called even be called planning, makes this Ronin debate even more interesting. If these experts have such doubt – and Stephen King himself was amazed planning was still same some 30 years on – then perhaps we need to re-evaluate. I don’t think the core message the communications/marketing disciplines are trying to get across has changed that much, but the vehicles for delivery are massively, massively different. As you’d expect. I’m willing to bet that I multitask online to a far, far greater degree than my father say, and lightyears ahead of his father. It’s not just being bombarded with messages – the rate at which change occurs is driving this fragmented landscape. It shouldn’t be surprising that how we process information is accelerating with ever-increasing rapidity. So, the old model for planning does look a little dusty in that regard. But does it need changing? Personally, (and this does have relevance, honestly) I’m enjoying having a basic, pay as you go phone at the moment – no pressure on me to ring someone (and not everyone knows my number; both a blessing and a curse). It’ll change when I get another contract phone through my insurance – the pace of life will up again. Perhaps advertising can be accused of increasing this pace of life. Certainly, ads can be seen to be urban graffiti nowadays- just legitimised by big companies…and that point of view is interesting, because it changes how and why you advertise. WCRS’s new mega spot for Sky illustrates this point. Advertising is not an immediate ‘go to’ for agencies – nor is it championed by the Ronin – simply because it doesn’t have to be; there’s no network bottom line to support, or agency to fund. Coming back to my point about Ronin – nowadays, we must not lose sight of our core skills, or core competancies; I fear that the rush to ever newer ‘mobile phones’/shiny objects/planning techniques could lead to the discipline being irrevocably damaged, and very hard to take seriously. ‘Advertising for Advertising’s Sake’ is hopefully dying a quiet death somewhere. The WCRS spot seems to indicate that advertising is beginning to realise just what’s what, and how people value a bit of peace and quiet and above all – to have the choice to tune out or in, right down to their employment decisions. And yes, being self aware is oh so important, now more than ever. 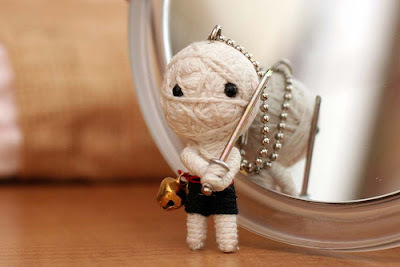 To know what you are good at and what you can do in these roamin’ Ronin times. It’s why I think the next great internet company may be on the verge of re-evaluating/reappraising how we work, and reformulating our job descriptions. Some form of more practical content aggregator, something like Huddle, I think. Imagine something like Facebook, only a Facebook that your employer, client and various other freelancers had work on, could view your work, approve it and so forth. You could even customise them to suit the client (making a client portal). It’s like having an online creative services assistant, which I think is very clever. I’ve just been playing about with it and it’s very interesting, especially in light of the recent San Diego Account Planning Conference, my former agency colleagues and my own situation. Counter to all of this of course is the notion of the ‘virtual agency’, and how it could become reality. Well, I don’t think the agency in its current form will die – I still think the best advertising work happens in bigger teams; with one person taking responsibility for the strategy, one for the client and one for the creative. BUT….I think the convergence of all of these things is incredibly telling, and I think that whomever can harness this Ronin movement (as Huddle may yet be able to – try it for free here) will do very, very well indeed. We shall see. ← More PSFK – Get It While It’s Hot…. 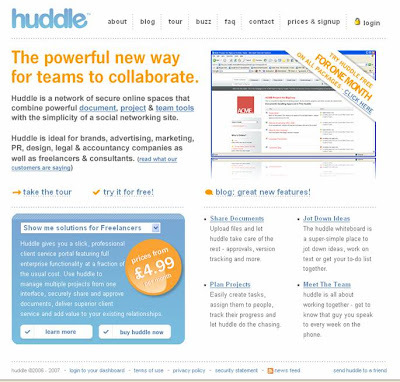 About Huddle: I think it might be a good personal organization tool. I don’t think it will work for group projects though. It lacks project management features, I guess. We’ve tried it, when we were looking for a tool for our team. Finally we stumbled upon < HREF="http://www.wrike.com" REL="nofollow">Wrike<>.